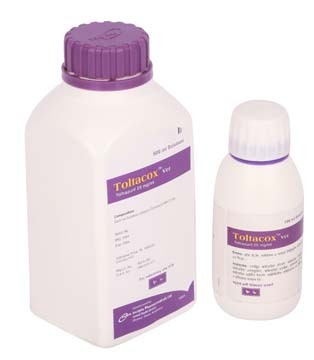 Toltacox: Each ml solution contains Toltrazuril 25 mg.
Toltrazuril is a triazinetrione derivative which is used for the prevention and treatment of Coccidiosis in poultry and turkeys. Light and electron microscope studies show that Toltrazuril is active against all intracellular stages of coccidia, including schizonts, micro and macrogamonts. It interferes with the division of the protozoal nucleus, the activity of the mitochondria and damages the wall forming bodies in the microgametes. That’s why Toltrazuril shows coccidicidal rather than coccidiostatic action. Tottrazuril acts on all intracellular development stages, does not inhibit immunity development, no need follow up treatment, Toltrazuril activity depends on severity of infection, compatible with feed additives and feed medication and has no adverse effects on feed and water intake, weight gain and F.C.R. Tottrazuril is indicated for the treatment and prevention of coccidiosis in poultry ( eg. E. tenella, E. necatrix, E. acervulina, E. maxima, E. brunette & E. mitis) and turkeys (eg. E. adenoides, E. meleagrimitis, E. maleagridis & E. gallopavonis). Treatment: 7 mg/kg body weight or 1ml/liter of drinking water or 28 ml/100 kg flocks for 2 consecutive days; 24 hours continuously or 8 hours each day in drinking water. In severe infections, the treatment may be repeated 5 days later. Prevention: 7 mg/kg body weight for 2 consecutive days within 10-18 days per month up to 4 months of age as a strategic administration program. Toltrazuril is well tolerated at recommended dose. However, at high dosages, egg-drop in laying-hens, growth inhibition in broilers and polyneuritis may be reported. Should supply the medicated drinking water as the only source of drinking water.